3D Models Design : Jason Knight is a 3D artist, illustrator from Salt Lake, Virginia, USA. He is a freelance artist with more than 33 years experience. According to his biography,"Digital media has allowed me to create and explore ideas faster and with greater freedom then ever before.A discovery of art software years ago expanded my creative exploration into all new realms. Today my pencils and paint brushes sit neglected and my mouse and Wacom art tablet receive much love". His 3D Models and character designs ideas are impeccable and they have delicate features. 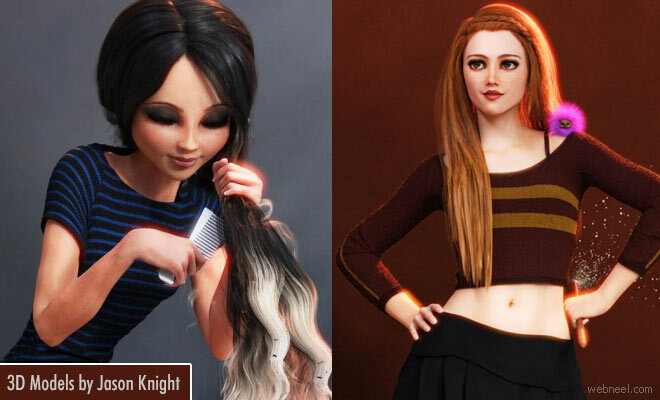 Most of his 3D Models designs are of little girls and women. Birds are not meant to be in cages and his idea of setting it free and it turns into a lovely young woman, is quite an interesting concept.